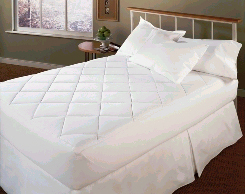 Fiber with antimicrobial protection is hypoallergenic and inhibits the growth of odor-causing bacteria, molds and fungus in the mattress pad. A fabric treated for stain release allows most oil and water-based stains to be removed without a trace during normal laundering or cleaning. Click the link for more information and a listing of available sizes!